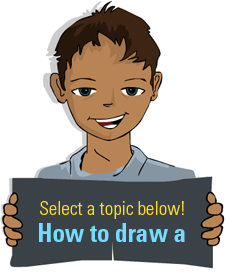 It is always easy to start your drawing by identifying the main features of the subject (the thing you are drawing). 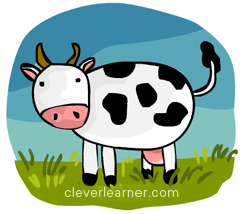 For a cow, what are the main features? The face, breast and tail (and sometimes the horns). With these in mind we can start. 1. Draw an oval (horizontally) for the main body and add a smaller circle to it for the head. 2. Add 4 rounded edge rectangles for the fore and hind limbs. The tricky part is the hind limbs, because you need to fix a small sac somewhere in between for the breasts. And oh, mark out the mouth area for on the head. 3. Now fix a tail for the cow. The tail can also come downwards. Next, fix the ears and 2 small horns on the head. Add eyes and nostrils! 4. Get some green colour at the base to give it a fore-ground. I do no know why many illustrators depict cattle with black and white skin, but it looks great anyway. You can keep it plain white, or plain back, or just add some black spots to the skin. 5. Colour the horns, breasts and if you like, shade off the top part of the cow's back with a grey, just so that it takes some form. 6. To break the white cow from the plain white background, throw in some skyline. Blue sky is always a great idea. Now add some texture to the grass... voila!